To many people, Amsterdam is synonym with freedom, and credited with being the most tolerant city in the world. And even its heraldic emblem and the phrase ‘Determined, Heroic and Compassionate’ refers to the DNA of Amsterdam. Here, people from 180 different nationalities are living together, which is more than any other metropolitan area in the world. In a society dedicated to tolerance, cultural diversity stimulated the exchange of ideas, and turned out to be the driving force behind Holland’s prosperity. During this tour you will hear the stories of a number of remarkable citizens of Amsterdam who left their mark on Dutch history, and we visit the locations related to their fight for freedom and tolerance. 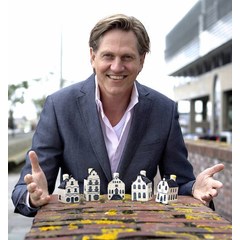 A number of the buildings you will see today are know the world over, because in miniature they are part of the iconic Delft blue house collection of KLM Royal Dutch Airlines. The secrets behind their facades are revealed in the book 'Kingdom by the Sea', which served as the starting point of this remarkable walk through history.